In recessionary times, when marketing dollars need to work harder, search is emerging as the clear winner and channel of choice for large enterprises that rely on the internet for lead generation. 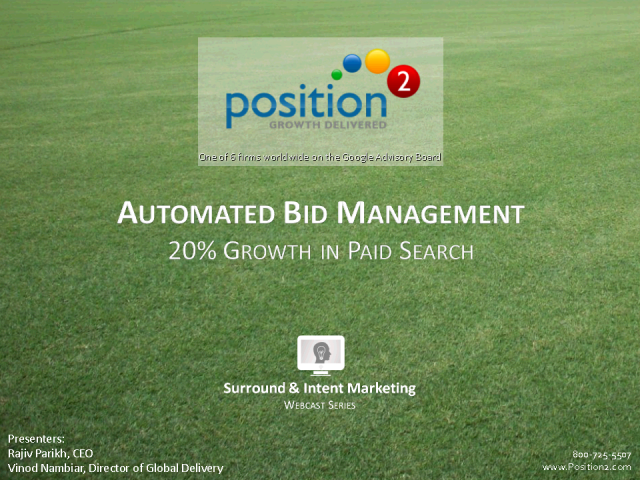 Paid search has moved up from being a backroom function to one that is closely monitored by CMOs and senior management. With the increased complexity and shortened cycles for paid search campaigns, there is an urgent need to improve the way enterprises manage and scale their paid search campaigns. In this webcast, Vinod Nambiar, Director Global Delivery and Vyom Khandelia, Director Technology of Position2, Inc. will discuss the value of automating bid management, and the immediate improvement in search results. The webcast will demonstrate the business value of automated bid management and share cases where marketers have improved returns by over 20%.